oftwominds-Charles Hugh Smith: Why Don't the U.S. Dollar and Bitcoin Drop to Their Tangible Value, i.e. Zero? Why Don't the U.S. Dollar and Bitcoin Drop to Their Tangible Value, i.e. Zero? If we refuse to recognize the high utility value of USD and its global ease of flow, then we will continue to misunderstand the demand for the dollar and its appreciation. I have covered the many reasons why the U.S. dollar (USD) has strengthened in dozens of posts over the past 5 years, (Could the U.S. Dollar Rise 50%?, January 12, 2011), and I described the positive dynamics of bitcoin last summer in An Everyman's Guide to Understanding Cryptocurrencies (June 13, 2016), back when bitcoin was under $600. The USD (as measured by the US Dollar Index) has gained almost 40% from 73 in 2011 to 102 recently, and bitcoin recently topped $1,000 (trading at $909 as this article goes to print). These gains aren’t trivial, nor are they magic. They are the result of basic economic forces: supply and demand, utility, liquidity, capital flows and risk management. Capital migrates to where it flows with the least resistance, i.e. to forms of capital that are liquid and offer low transaction costs—what I call ease of flow. Capital also migrates to relatively safe havens that are liquid and offer low transaction/holding costs, and to forms of capital with global utility. Lastly, capital flows to the highest yield/return with the lowest perceived risk. Given these fundamentals, it isn’t difficult to understand why capital is flowing into USD-denominated assets and bitcoin. 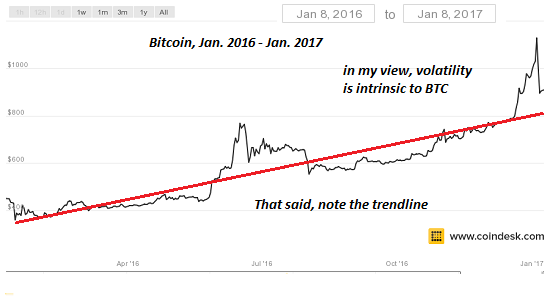 So what do the fundamentals suggest about the valuation uptrends in the USD and bitcoin? Have they topped out and due for a crash, or have they just started their appreciation cycle? 2. The inability of central states and banks to control their currencies and their place in the global economy. Why Don’t the U.S. Dollar and Bitcoin Have Zero Value? There’s a fair amount of confusion about why currencies (or in the case of bitcoin, digital commodities that share the utility functions of currencies) that are unbacked by tangible assets such as gold don’t just drop to their tangible value, i.e. zero. After all, most USD are just digital entries and the rest are just paper. Bitcoin is also just a digital construct with no intrinsic value. The answer boils down to utility-driven demand. If, as David Graeber discussed in his book Debt: The First 5,000 Years, notched sticks are needed to pay one’s taxes, then notched sticks are in demand because they have an essential utility; notched sticks acquire value (i.e. become “money”) if you can pay debts (such as taxes) with them. As long as they retain this utility, they retain the value ascribed to them by the system that recognizes (or demands) payment of taxes in the form of notched sticks. A notched stick has near-zero tangible value. Its value is entirely a social construct, as a placeholder for the goods and services produced by labor and capital. It frustrates many observers that the U.S. dollar stubbornly refuses to drop to its intrinsic value, i.e. zero. This peculiar resistance melts away once we understand that state-issued currency ("money") is ultimately a claim on the issuing nation’s wealth and capacity to generate wealth, and on the state’s ability to collect taxes from the residents and enterprises that are generating the wealth. In other words, the value of state-issued currencies is not based on a tangible commodity such as gold but on the wealth generation capacity of the nation and the state’s power to skim that wealth as taxes, which can then be used to pay state debts. The state can (and as history shows, often does) abuse its privilege by issuing currency far in excess of the wealth generated by the nation’s people and enterprises. If the economy generates 10 units of new wealth (surplus goods, services and capital) and the state prints 20 units of new currency, the new currency devalues the existing stock of currency. If the state issues 10 new units of currency in alignment with economy’s expansion, the issuance will not devalue the existing stock of currency because the new “money” is in essence backed by new wealth in the form of goods, services and capital. The expectation that fiat currencies (state-issued “money” that is not backed by a store of tangible commodities) should all decline to zero because they have no tangible value makes sense only if we ignore non-tangible sources of value. The wealth of a nation is tangible, and so is the state’s power to collect taxes to pay its debts. These are as tangible as gold once we realize that demand creates value, whether we consider it intrinsic or a social construct. In other words, even so-called “intrinsic” value forms of money are, beneath our cultural assumptions, social constructs. Once we understand that demand creates value, then the source of the demand matters more than our assessment of what is "intrinsic." There is a built-in demand for stores of value (the time-honored driver of demand for precious metals) but there is an equally built-in demand for means of exchange that offer all the characteristics listed earlier: liquidity, utility, ease of flow, relative safety, potentially high yield with low risk, etc. Those who focus on the scarcity value of gold to back a currency are overlooking the equally potent means of exchange sources of demand. Scarcity (supply) is only half the equation—ultimately, demand drives value. If something with zero intrinsic value (notched sticks, paper currencies, digital cryptocurrencies) provides utility value—it can be used to pay debts and taxes, it is liquid, relatively safe and has low transaction/storage costs, etc.—then demand for the currency is what creates its value. Broadly speaking, any utility value that creates demand for the currency creates value. Creating new currency in excess of the expansion of its ultimate base, the economy of the issuing state, devalues the existing stock of currency. But if demand exceeds supply, the currency appreciates regardless of the expansion of the currency. This is what frustrates those who keep expecting the U.S. dollar to falter because new dollars are being created in what they reckon are excessive quantities. But if global demand for dollars exceeds supply, the value of the USD can only appreciate. This brings us to one of the most confusing aspects of state-issued fiat currency: the reserve currency. I have addressed the unique characteristics of the reserve currency many times, for example: Understanding the "Exorbitant Privilege" of the U.S. Dollar (November 19, 2012). What many observers seem to overlook is the utility value of a reserve currency that can support the expansion of debt and currency in the nation that holds reserves of that privileged currency. In other words, the U.S. dollar is not just the currency Americans need to pay their taxes, or the currency used in the U.S.—it is a form of relatively predictable, highly liquid capital with low transaction/storage costs that is the collateral for the holding nation’s own currency and debt issuance. Why would any nation hold reserves of USD over, say, reserves of gold? One part of the answer is global trade and capital flows. Nations with surplus goods and commodities to sell on the global market will generally find buyers in the U.S. willing to buy the surplus goods and commodities with USD. That trade generates a flow of goods and commodities to the U.S. and a flow of dollars back to the exporting nation. These dollars have a variety of utility value. They can used to buy other goods and services globally, serve as collateral for loans, earn interest with low transaction costs when converted into U.S. Treasury bonds, and so on. In certain ways, USD offer more utility value than gold or any tangible form of collateral/capital. Bitcoin is quite different from the USD but it, too, has unique characteristics that drive its demand and thus its valuation. In Part 2: Estimating Bitcoin's Fair Value, we consider the global circumstances that will govern demand for bitcoin and thus its valuation in the global marketplace. Our analysis shows that it's quite easy to make the argument for valuations higher its current trading price. Far higher. Thank you, Donald B. T. ($5/month), for your magnificently generous subscription to this site -- I am greatly honored by your support and readership. Thank you, Sue R. ($5/month), for your superbly generous pledge to this site -- I am greatly honored by your support and readership.